Natural blue kyanite is a MAGICAL and gorgeous stone that I can’t keep in stock because of the high demand. It’s been a long time since I’ve found pieces of this size and quality to offer you. These are gorgeous, huge, gemmy pieces that could (and should!) be used in jewelry as well as carried with you in your medicine bag. 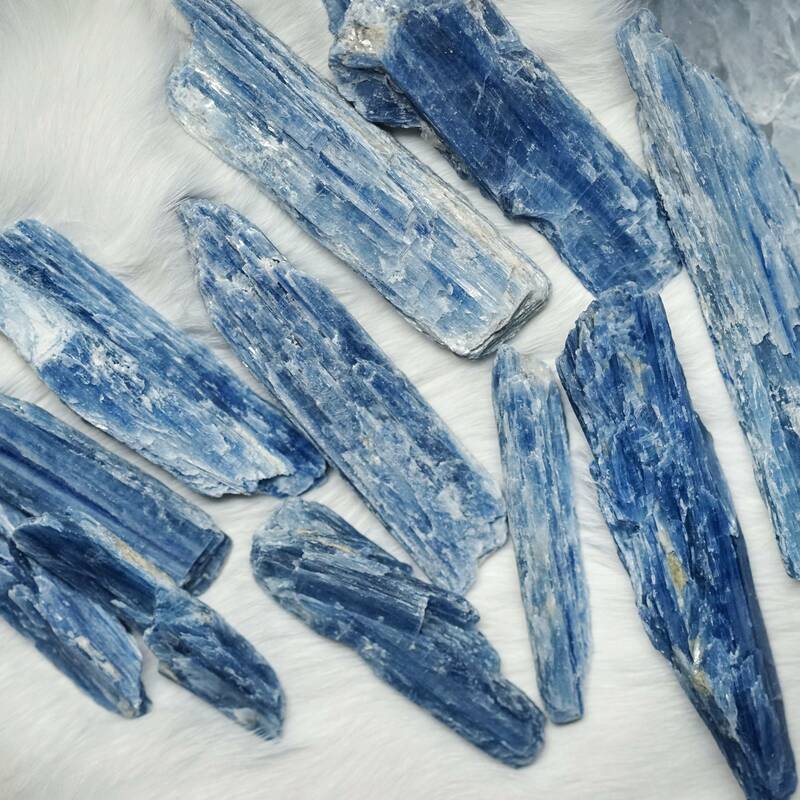 Kyanite is an aluminum silicate mineral with a triclinic crystal system. Kyanite is one of my favorite stones in all its colors – orange, green, black, and blue. It’s an energy worker and transmitter, amplifying high vibrations and filling spaces with positivity, and a stone wonderful for all kinds of work: meditation, space holding, energy clearing, and even healing. carry blue kyanite with me to stressful meetings or family events to keep me grounded and in present time. This stone is one of my top 5 “you can’t be without this!” gems. Blue kyanite brings overall cellular alignment and balance, and draws you inward toward your core,. It strengthens your will and vision so you move in concert with the Highest Good. It’s the stone of finding your sacred center. It is the ONLY stone known to instantly and evenly align all 7 chakra points, and this brings you into fully centered presence. Wear it, hold it in meditation work, place it on any chakra during energy healing (especially your throat), or carry it with you. Choose wire wrapped from the drop down menu if it speaks to you. It’s a major Throat Chakra healer, so if you are someone who struggles to express yourself or communicate openly work with this stone to clear and align that Throat Chakra. Self truth is also governed by this chakra, so alignment and healing of Vishuddha energy greatly impacts your ability to be honest with your innermost self. This in turn flows outwards to your interactions with those around you. I have three (3) sizes to offer: Small (2-3″), medium (3-4″), and large (4-5″). This listing is for (1) blade of natural blue kyanite of your choice in size or style, which will come gift-bagged in organza, with a white sage leaf that you can use to clear energies before using. You will also receive a card describing the properties and recommended use of each stone. Each piece is chosen carefully and vetted for quality. Shop with confidence. ~*~ ~*~ ~*~ ~*~ ~*~ ~*~ ~*~ ~*~ ~*~ ~*~ ~*~ ~*~ ~*~ ~*~~*~ ~*~ ~*~ ~*~ ~*~ ~*~ ~*~ Charge your tools with orgone energy on my custom Orgonite Charging Plate. Anoint your crystals and gemstone jewelry with my SG Anointing Blend. So when I first got my wire wrapped kyanite, I thought it was so huge it wouldn’t look good on my neck. But when I started to wear it I fell in love with it. The first few days I wore it, I almost felt spacey as my energy system was integrating the high vibration of the stone. I do intuitive readings, and wearing it while I work has taken my intuition up to the next level. I love the fact that it’s so huge now, it’s like having a wand around your neck. I get so many compliments when I wear it as well. I would highly recommend this stone. The one item I wear all day long when I put it on. Exquisite, sweet and lovely. One of my favorites! Thank you!!! Wow I didn’t think it would be as large as it is, pleasant surprise! I love it and am so happy with the purchase. I would consider this a high quality gemstone. My fault, but holy cow! So I wanted a small wire wrapped, and as per usual didn’t read the directions and just picked small, and wondered how it could be offered so cheap, lol. However, the piece of kyanite I have I’d consider an XL, no kidding, it is the biggest I have by far, and gorgeous! I just can’t wire wrap to save my life, apparently I’m not meant to wear kyanite as a necklace, lol. And funny, I had just noticed the small piece I had put with a green kyanite that I was going to try to wrap, was missing. This pendant is awesome, the piece of blue kyanite is about 4 inches long. It is much bigger than what I expected. I love it!